Happy Wednesday! Yesterday, we celebrated Olivia's fifth birthday and in her words it was the "best day ever!" Olivia and I went out for breakfast, made ice cream sundaes with her preschool class, she enjoyed water day at school, spent the afternoon having fun with her grandma, and then we finished her day off with dinner (complete with baked beans- her favorite food). Birthdays are so much fun to celebrate, especially when it's your child! I love making them feel loved on their special day. 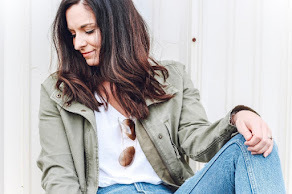 Today, I'm styling two gorgeous pieces from Downeast's new arrivals! I discovered Downeast about seven years ago after my oldest daughter was born. 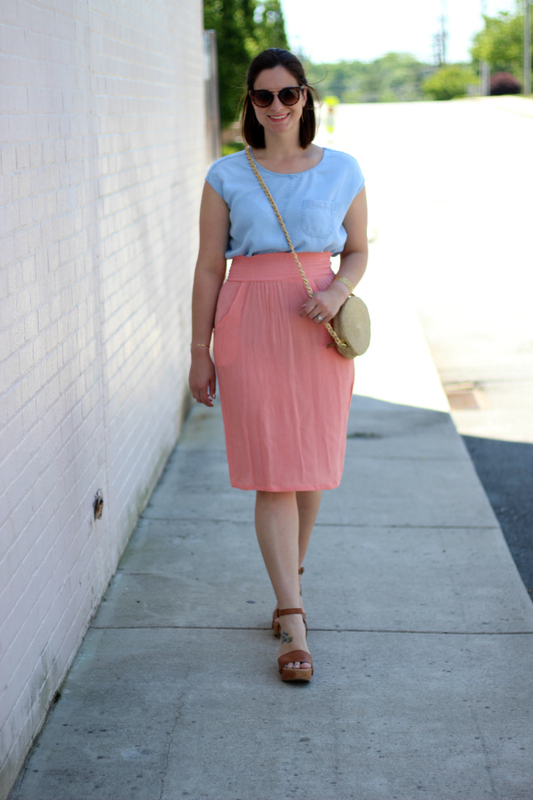 I remember seeing someone wearing a gorgeous Downeast skirt on their blog that I was reading. The style of the skirt was modest yet stylish and so perfect for my life as a teacher and mother. The quality is also incredible and budget friendly! From the new arrivals, Downeast sent me this beautiful Rain or Shine Top. 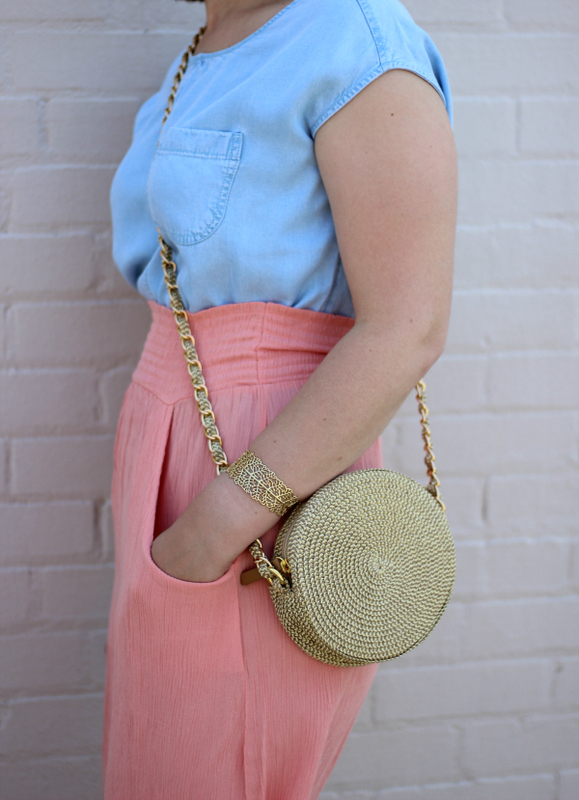 It's the perfect short sleeve chambray! It would also look so cute with dark denim. This top is so soft and is most definitely a closet staple! I paired it with the Pull It Up Skirt in Desert Pink (the color is close to coral). This smocked waist skirt has pockets! I love pockets. The midi length makes this skirt perfect for church or mom duty. To dress it down, I would also style it with a tee, sneakers, and a denim jacket. For size reference, I'm wearing a small in the top and the skirt. I'm so excited to add both of these pieces to my springtime wardrobe! Sounds like it was a fun bday celebration! I love this color combo! Beautiful! Sounds so fun! I love the pink and blue!!! I love the coral and light blue together!! I also love how the skirt has pockets! I love this bag!! It's so fun and unique. Loving the colors of this outfit! I adore the skirt. Sounds like a great way to spend her birthday. I love this casual outfit combo. I LOVE the skirt and the bag! So cute! 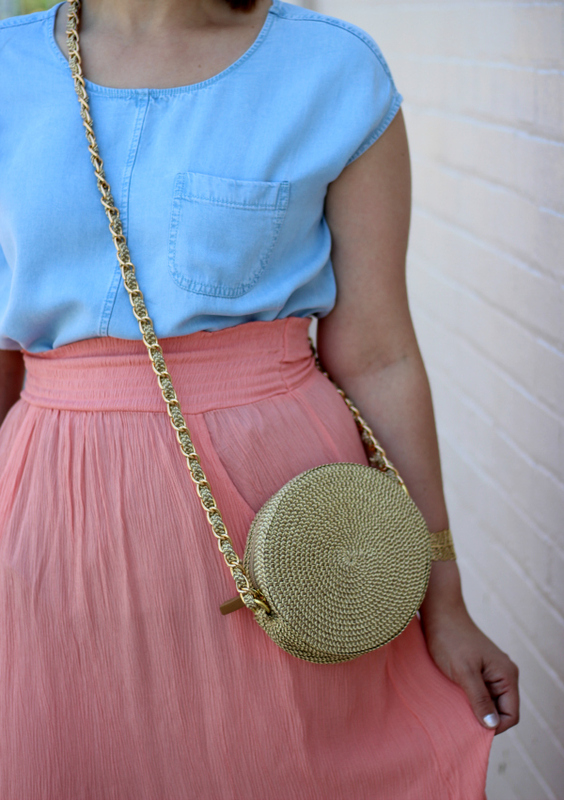 such a cute bag and love the color of the skirt! The color combination of this look is so cool! You look so beautiful too!